This fruity and refreshing mango blood orange sorbet made with ripe mangoes, blood oranges, sugar syrup, lime juice and orange liquor. This mango sorbet was inspired by a combination of two memories from Ecuador. The first one is of the fruit smoothies my mom made, she would mix different fruits together so that the result would be a whole new delicious flavor. My second inspiration are the refreshing Ecuadorian “helados de paila”, which are essentially fruity sorbets made from a huge variety of fruits: mango, strawberry, naranjilla, coconut, moras or blackberries, orange, taxo, guanabana, etc. 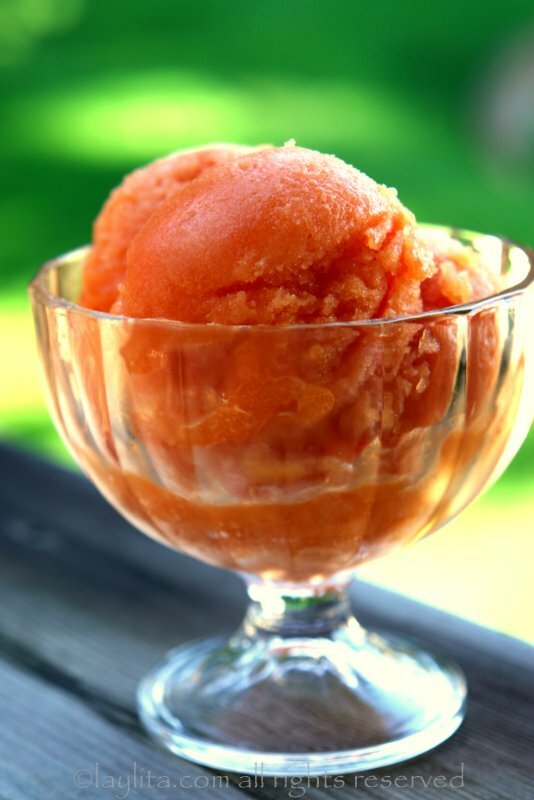 Fruity mango and blood orange sorbet made with ripe mangoes, blood oranges, sugar syrup, lime juice and orange liquor. Combine the sugar and water in a small saucepan over medium heat, cook until the sugar is well dissolved and let it cool down. Blend the mango flesh and the orange juice with sugar syrup, lime juice and salt. Put the mango orange mix in the fridge to cool down for about 20-30 minutes. 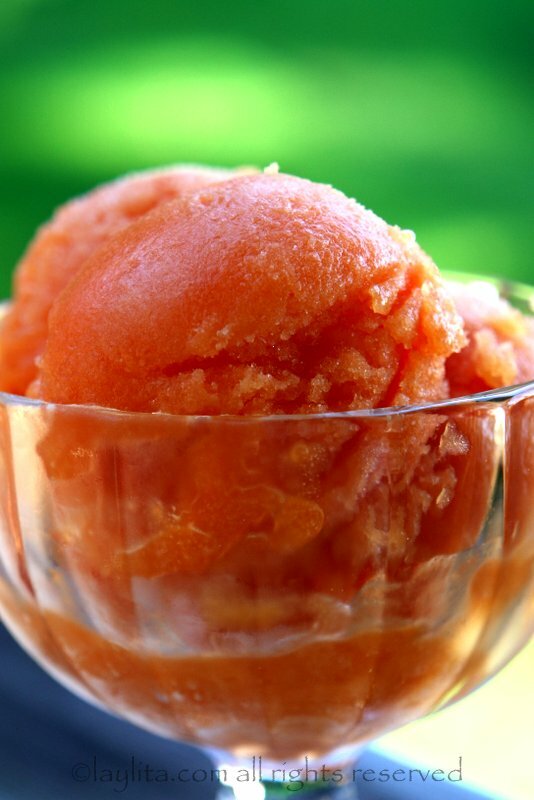 Add the orange liquor and prepare the sorbet according to your ice cream maker instructions. 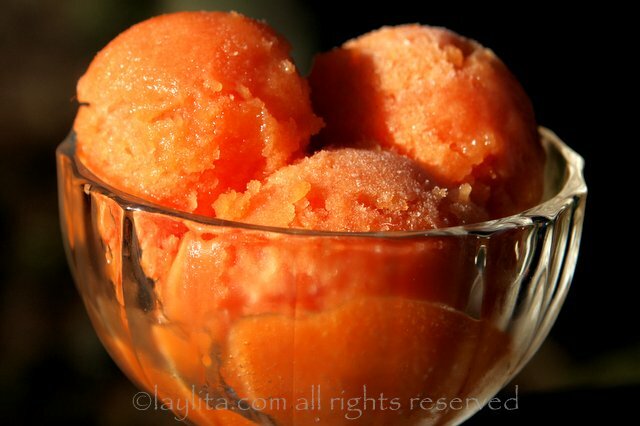 Place the sorbet in the freezer for at least an hour and serve. The traditional helados de paila are made entirely by hand using a large copper bowl called a “paila” over ice. They are so good and refreshing! My mango blood orange sorbet isn’t exactly made according to the traditional method (obviously no paila was used). The traditional style helados de paila also use beaten egg whites. 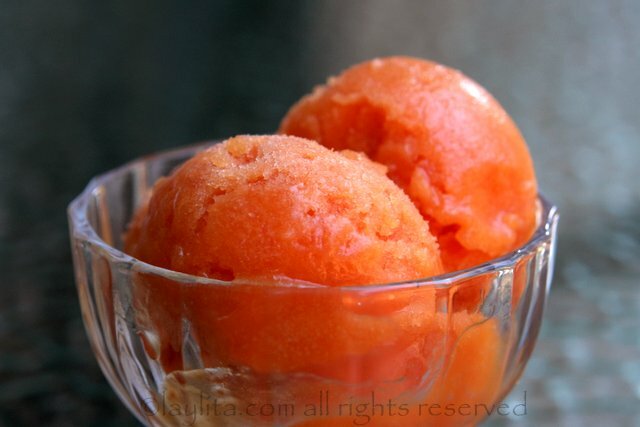 I made this mango sorbet using blood oranges because they add a colorful and tasty kick, but regular oranges can also be used. Such a wonderful recipe – so refreshing in summer and cleanses the palet so well. Thank you for sharing. The flavor of the fruits seem to burst in the mouth as one takes each bite of a scoop of the helado de paila. My personal favorites are: Naranjilla, guanabana and taxo. When I last went with my wife we had an scoop everyday after dinner. That is a quality aperititif. By the way great blog. 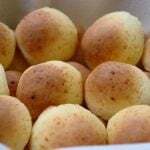 I desperately want to get me a paila. I am missing out on too many good recipes without it! Lovely sorbet. Laylita, there is an award for you on my blog! 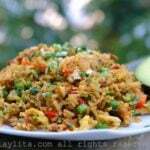 This looks so luscious! The color is gorgeous! I can almost taste it now. I’m bookmarking this one for sure! This looks wonderful! 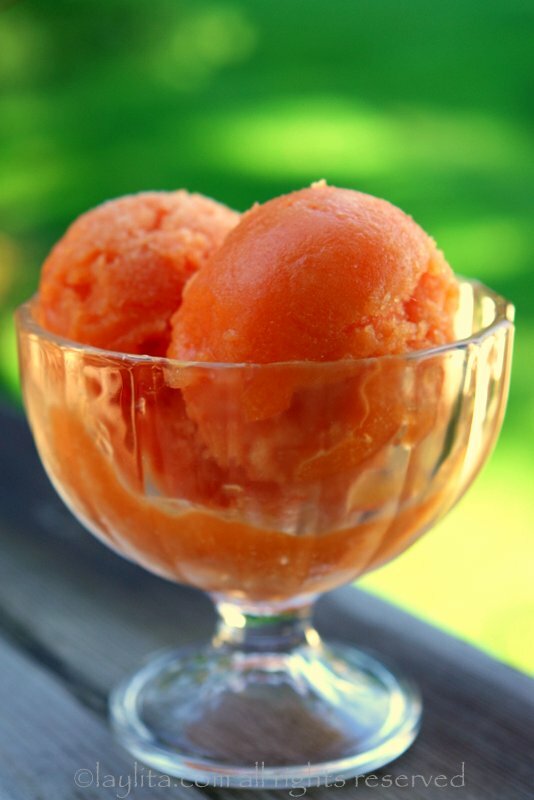 I made a mandarin orange sorbet this winter for the first time. It was so refreshing. I’ll have to try this version. Beautiful blog, by the way! Oh! That sounds like an extraordinary and magnificent combo! This is my first time at your lovely website. I was cruising through the internet for some colorful sorbet and your website popped up! I took a look around and I am already a fan!